Just collected your GCSE results and unsure what to do next? Like the idea of being able to earn while you learn in a rewarding, well-respected and future-proof trade? If so, a plumbing apprenticeship could be the next step you're looking for. This week, the team at APHC On Tap have set out several reasons why you should consider one as a rewarding and viable alternative to university as well as important factors to consider when making your decision. With a recent report suggesting that student debts wipe out any graduate premiums in most professions, apprenticeships are becoming an increasingly attractive option for school leavers, allowing them not only to avoid substantial tuition fees but also to earn money whilst gaining valuable practical skills and knowledge. Apprentices can earn up to £5.99 in their first year of training and highly experienced plumbers can also bring in very attractive salaries - often equal to or exceeding the amount earned by graduates. Plumbing offers greater job security than many other careers. Plumbers offer a service that will always be in demand, their skills cannot be digitalised and plumbing jobs cannot be outsourced for cheaper labour overseas. Plumbing is also a very varied trade, with lots of options to specialise in an area that takes your interest. For example, installers can choose between domestic and commercial work, whether to undertake contract work or even whether to become their own boss by setting up their own business. What will I do as an apprentice? As an apprentice, you'll be required to work under minimal supervision to complete the installation and maintenance of many different plumbing systems and components including domestic hot water, cold water, sanitation, drainage rainwater systems and central heating. 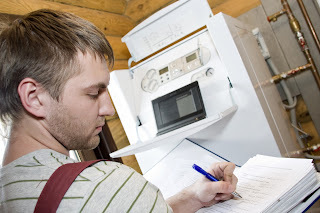 An apprenticeship will allow you to develop your skills and enter the profession at a higher level, equipping you with the skills to install, service and maintain systems such as gas fired water and central heating and gas fired warm air appliances. As a member of the plumbing and heating industry you'll also need to remain at the forefront of technological changes in both traditional systems and new technologies, for example, environmental systems such as heat pumps and solar water heating. Another important part of the job involves ensuring these systems are designed and installed to meet strict legislation and exacting design criteria. For this reason, school leavers with at least a C in maths, English and a science or technology subject are more likely to be successful in a plumbing apprenticeship. It's worth remembering that plumbing and heating can be physically demanding at times, for example, when operating tools or crawling under the floor to fit pipework, and also requires a good level of maturity to complete a wide range of tasks under minimal supervision. For this reason, it's important to be honest with yourself when considering whether a career in plumbing and heating is right for you - anyone thinking that an apprenticeship is a "soft option" will soon find out otherwise! As many plumbing and heating companies treat an apprenticeship as an investment in the growth and development of their business, there's a good chance you'll be offered a permanent position on the successful completion of your training course. With all the advantages a career in plumbing can offer, it definitely makes sense to give it some serious thought! If this post has convinced you that a plumbing apprenticeship could be right for you, more information can be found at http://www.jtltraining.com/apprenticeships/ or by contacting your local college.